'Captain America: Civil War' releases on May 6th and has already generated waves of box office breaking anticipations. 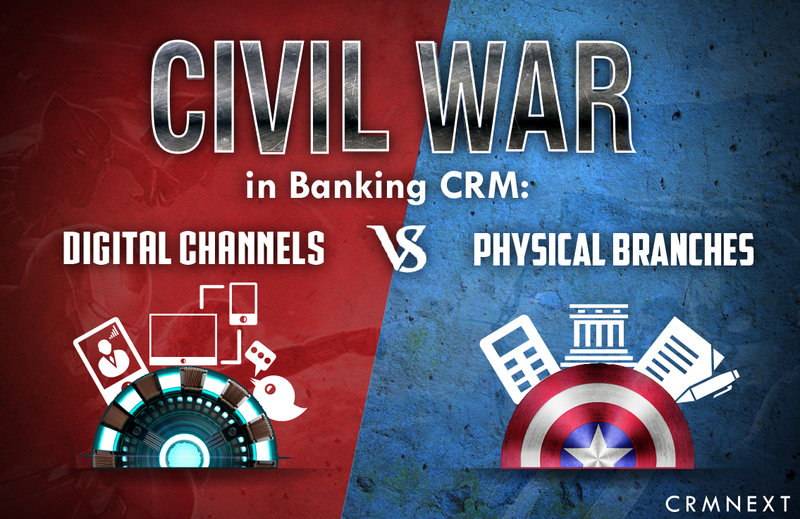 But are you aware of a different (bloodless, but packed with action) civil war going on in the banking sector? The war between digital channels and physical branches. "Early adapters of Digital CRM are taking off quickly enough to almost unseat an inattentive traditional banking megastar." Digital CRM is the latest avatar of intelligent and intuitive CRM, that goes beyond the mundane version of record keeping. Because of it, a customer no longer needs to visit the physical retail branch to carryout financial transactions. All what is needed is access to the internet and a computer, laptop, tablet, smartphone or watch. In a matter of minutes, the customer will have ordered a new check book, initiated a wire or bank transfer, issued a standing order, stopped a check payment, applied for a loan and much more. Based on the virtues mentioned above, customers should flock to digital channels, right? But, though digital banking CRM is seen as the future of banking, many end-customers still prefer to visit the physical Branch. The traditional way of banking is where a customer visits his nearest or home branch. Such arrangement created a personal relationship between the customer and branch personnel. He felt more appreciated and valued when talking to a bank representative on a one -on-one basis. Unlike virtual channels, that give out a 'machine' like vibe. Digital channels are based on the "Internet of Things(IoT)" where users get automated responses from machines and not people (although JARVIS in real life would be super cool). The popular assumption is that physical branches offer better customer experience management (CEM). The relationship manager or customer service representative is able to be personally involved in knowing the customer and in return offer better services. The traditional mode of banking offers more personalized banking as the service giver aims at addressing the issues relayed by individual customer at the branch. Also, customers are loathe to give up their sense of 'control' over physical assets. They don't trust the machines (thanks to hackers and Terminator, maybe) on the safety of their hard earned money. However, even with so many merits,physical branches are much slower (suffering from queue syndrome), more costly, and requires more resources. However,as much as the naysayers choose to deny, digital channel is the future of CRM solutions. In fact, some fin-tech pundits are going on record stating that physical branches for banking are dying. A user can choose to go online or use apps designed for smart and wearable devices. They can share their opinions or dissatisfaction in real-time. Banks can offer complete banking of service to the customer at their fingertips with mobility. Digital channels keep track on the happening in the industry and this helps in providing better services regardless of the distance, type of customer, or nature of problem. Is it necessary that there should only be one winner? The ultimate victory is when both sides win. Both physical branches and digital channels should merge through agile Digital CRM solutions that appeal to customers personally. They can design business workflows that weed out bad processes, thus shortening service cycles. For example, a leading auto lender slashed loan approval times from 3 days to less than 3 minutes (click here to learn how). In another instance, the largest private lender in Asia slashed its operating costs by 30%. Such synergies of physical branch and digital channel will offer better personal satisfaction, makes customer feel more valued and will deliver delightful customer experience. After all, isn't that the ultimate target of both?